Issues $10 each plus $2 postage. Subscriptions are $15 for two issues. To become an Active sponsor of Redactions is easy, just donate $20 - $99.99. You will receive a free issue of Redactions for your support. RedActive sponsors need donate only $100 or more, and you will receive a two-year subscription. And both sponsors receive our gratitude and a magnetic car ribbon. We also thank our contributors for the opportunity to publish their wonderful work in each issue of Redactions: Poetry & Poetics. (If you wish to be a sponsor, please make out checks to Tom Holmes and send to 604 N. 31st Ave., Apt. D-2, Hattiesburg, MS 39401.) You can also donate here: https://www.etsy.com/shop/RedactionsPoetry. Redactions tends to read all year. We will note here when and if we temporarily close to submissions. On May 31, 2019, Walt whitman will be 200 years old, and we want to celebrate it. 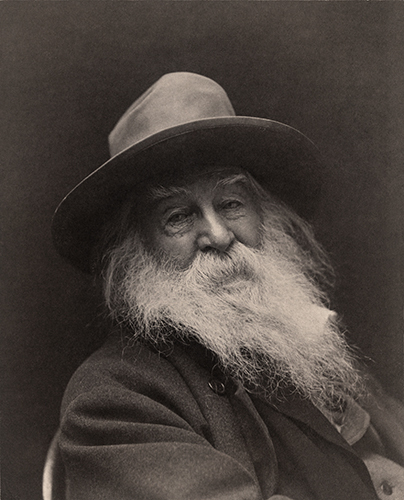 Please send us your poems inspired by or relating to Walt Whitman and/or short essays (1000 words or fewer, preferably around 500) about Walt Whitman, such as his influence on you or what he means to you or an interesting or personal insight about him and his work. When submitting. Please be sure to include "Whitman" in the subject line of the email, as well as in the cover letter. Walt Whitman submissions open on May 31, 2018 and close on December 31, 2018. You may also send non-themed poems. There is no deadline for non-themed submissions. Redactions: Poetry & Poetics encourages submissions from everyone of every gender, race, religion, or sexual orientation. Please include your work, brief bio, & your snail mail address in one attached file or pasted into the body of the email. We only accept submissions through email. We accept simultaneous submissions. Immediately inform us if a piece of work is accepted elsewhere. We do not accept previously published work. We prefer Word attachments, but RTFs and PDFs are okay. Please do not use links to cloud services, such as Google Drive or OneDrive. We try to read submissions throughout the whole year, & we generally respond in about two months. Please wait for response to a submission before submitting again. Emails that have no subject line or have nothing written in the body of the email will be deleted. We do not accept blank emails with only an attachment. That scares us. All rights to published work(s) revert back to the author. (Please mention first publication in Redactions: Poetry & Poetics if the work is reprinted.) Payment is one copy. To submit poems or poetry-related materials, such as poetry book reviews or essays about poetry or poets, please email us at redactionspoetry(at)yahoo.com (replace "(at)" with "@") and attach a submission of 3-5 poems into one Word, Wordpad, PDF, or Notepad document, or paste the submission in the body of the email. We no longer accept fiction or creative non-fiction submissions. If you are sending a work of art, please submit as low-resolution JPEG or TIFF. If accepted, we will ask for a higher resolution image. Email submission to redactionspoetry(at)yahoo.com (replace "(at)" with "@").